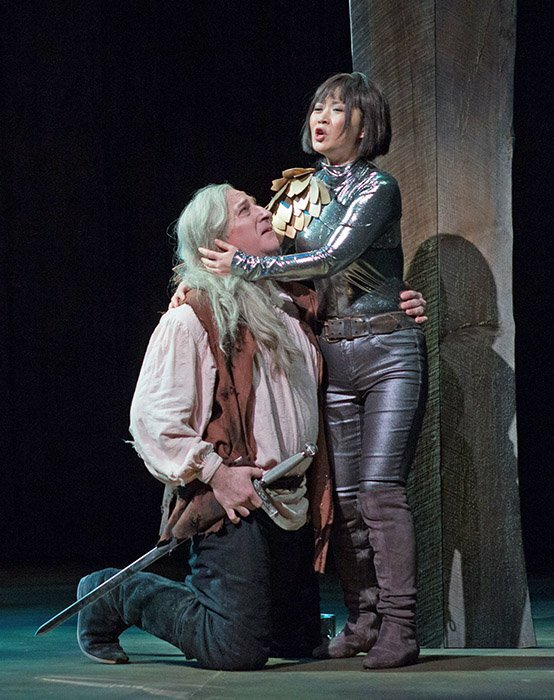 Odyssey Opera ends this year’s season tomorrow at 7:30 (I attended last night) at the Huntington Avenue Theater with Verdi’s rarely heard Giovanna d’Arco, their fourth operatic representation of Joan of Arc in Boston this year—plus one opera set earlier in the Hundred Years War. Each of the “Joan” proffered an original treatment of the Maid of Orleans—by Tchaikovsky and Verdi (though with operas that are little known)—and two unusual approaches by Norman Dello Joio and Arthur Honegger. A bonus, The Siege of Calais by Donizetti, dealt with an earlier event of the lengthy war between France and England in the 14th and 15th centuries. This has provided even more evidence of music director Gil Rose’s approach to programming: themes that link the season’s operas by introducing works that rarely, if ever, have been performed in Boston. Verdi’s seventh opera Giovanna d’Arco benefited from his considerable experience, though it has never been so often performed as the earlier Nabucco (3rd) or Ernani (5th) or the later Macbeth (10th) or Luisa Miller (15th), to say nothing of Rigoletto (17th), which has for over 150 years been regarded as the beginning of Verdi’s mature style. Still, Giovanna contains many extraordinarily beautiful passages that already bring great pleasure to the listener while anticipating the masterpieces to come later. This obscure work calls for only five solo singers, three of them representing the convenienze (traditional appropriate voices) of the bel canto period—the basic three, soprano, tenor, and baritone, who frame the plot from whatever source it comes. Almost without exception the soprano and tenor are a romantic couple, while the baritone represents some kind of opposition, whether a rival lover or the girl’s father. 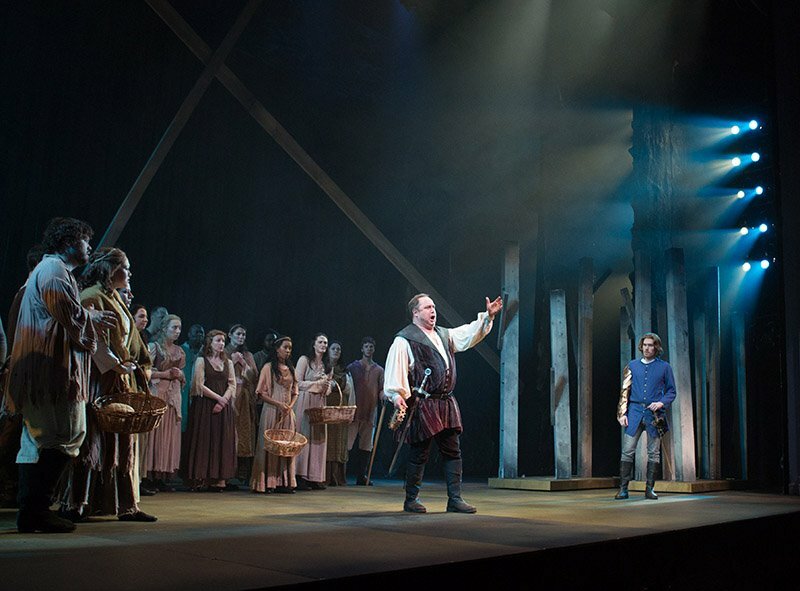 For this production, three singers made their debuts with the company. Each boasts substantial of experience both in the United States (including at the Metropolitan Opera) and elsewhere. As Charles VII, Marc Heller’s tenor rang with his passionate address to Joan, though at first, he seemed ready to give up the battle, lay down his crown, and turn his country over to the English. But while visiting an image of the Virgin in the forest he meets Joan, falls in love with her, and sees a path to success in battle, at which point his vocal line takes on a fully heroic quality. The baritone role of Giacomo, Joan’s father, goes to Daniel Sutin, who spends most of the opera accusing her of consorting with the devil (convinced, as he is, that she has fallen in love with Charles and lost her virginity to him). His character is single-minded, allowing little emotional or tonal variety. Unlikely as it may seem, he constantly expresses charges against his daughter or promises to turn her over to the English for trial and execution. Sutin’s voice is big and a shade raw (all but overwhelming Joan and Carlo in their big trio). Only at the very end, when he understands that Joan is, in fact, pure, causing him to abandon his charges against her, is he able to pursue a less narrow dramatic range. The opera succeeds or falls on the strength of the soprano singing Joan, whose role is extensive and as varied in its demands as those of Abigaille in Nabucco and Elvira in Ernani. An extraordinary Korean soprano, Haeran Hong, bore the opera on her shoulders, with the full range of dramatic elements, from her prayer to the Virgin to her bold assertion of her willingness to lead the French army into battle, and her hope to escape from an English prison before encountering death on the battlefield. (Unlike within the historical account, the English have no chance to burn her at the stake.) Hong has the vocal power to lead the army, and the flexibility to sing of the beauty of her forest and her little hut there. And she has the acting ability to wield a sword athletically on the one hand and to despair in chains on the other. The two smaller singing parts were leaders of the two opposing armies, Christopher Carbin (bass-baritone) as Talbot, the leader of the English forces, and tenor Jeremy Ayres Fisher, as Delil (DeLisle), an official of the French king. Both sang and acted their parts effectively. From as early as Nabucco, Verdi had won a name as a composer of choral passages in his operas, an element that he continued to include in most of his works to the very end of his career. The chorus in Giovanna d’Arco (ably trained by Mariah Wilson) took the roles of courtiers, the people, and both French and English soldiers with rich sonority and appropriate variety. Gil Rose shaped the orchestra with color and expression, not to mention the strong dramatic pacing. Throughout the opera there were wonderful orchestral touches, sometimes of chamber music delicacy, with only two or three solo instruments (English horn and cello, for example) accompanying a vocal passage. As we’ve come to expect at Odyssey Opera performances, the orchestra captured the precise sonorities of Verdi’s style, both in full sonority and in solo or chamber passages. The score that was used for this production was that of the new critical edition edited by Albert Rizzuti (the first publication of the opera in full score), which restored the full text and give the complete, accurate orchestration. The staging of the work by Beth Greenberg was straightforward but very effective. The two groups of soldiers responding to changing fortunes of war and the townspeople (mostly women) moved and posed in ways that projected the various situations without making the scene overbusy. The two dancing angels (Lana S. Albuquerque and Sophie Kennedy) that appeared with Joan, were light and airy. Brooke Stanton’s costumes allowed the clear distinction between the opposing armies as well as among the courtiers, common people, and clergy. Joan’s military uniform, of a metallic cloth that dazzled in the light, was very effective, as was the angel’s wings that appeared from under her robe as she arose from death in the final moments. Dan Daly’s set consisted largely of “trees” made up of wooden beams standing irregularly at various lengths. Other simple pieces were moved onto the stage as the outline of the cathedral or the shrine of the Virgin. Dennis Parichy’s light cues adapted the moods from scene to scene as desired. Passionate devotees of Verdi can occasionally get a chance to see some of his early works, but certainly not as often as they might like. And most opera-goers rarely get the chance at all without traveling far and wide to do so. Here again (as with the even less well-known Un Giorno di Regno a few years ago), Gil Rose and Opera Odyssey have put Bostonians in their debt with a welcome production of a beautiful outpouring of Verdi’s music that allows us to revel in such rarities. Sometimes music in Boston isn’t just an “embarrassment of riches” but “a torture of riches.” Too bad “Giovanna d’Arco” was in competition on Thursday with Jonas Kaufmann’s Tristan at the BSO, and tonight with Lawrence Brownlee’s recital at Jordan Hall (which was supposed to be a duet-evening with Eric Owens until the latter’s illness caused his cancellation). Tickets for these were bought months before Gil Rose’s season-dates were announced. If they hadn’t been bought so early, having to make a choice would have been excruciating. I’m not complaining; I’m only expressing my frustration. Milan’s original Joan (Giovanna) and King Charles (Carlo VII) were written for a specific husband-and-wife team: coloratura prima donna soprano Erminia Frezzolini and tenor Antonio Poggi. Baritone Filippo Colini co-starred as Giovanna’s father Giacomo. Frezzolini (1818-1884) had worked with both librettist and composer before, and she had become one of the leading divas at La Scala in this period. She was a very busy performer, often appearing with as many as four different Italian companies per year. When Giovanni d’Arco transferred to Rome three months after its Milan premiere, papal censors demanded changes. In this period, Verdi was required to submit forty-one copies of any opera under Roman consideration for examination (checking for issues of religion, morals, good manners, respect for the law, respect for persons, and “philological concerns”). They removed all direct religious references from Giovanna’s plot (! ), changed the scenery to avoid the colors of the Italian flag, and shifted the setting to the Greek isle of Lesbos to avoid presenting a woman as a liberator of a major European power: Joan of Arc was transformed into Orietta, a Genoese heroine leading the Lesbians in battle against the Turks. This revised version (Orietta di Lesbo) also enjoyed a run in Palermo in 1848, and several other revised versions of the original score were created for different Italian localities. Odyssey Opera is using Alberto Rizzuti’s new critical edition of Giovanna d’Arco, the first publication in full score. This version is based on the composer’s autograph score preserved in the archives of Verdi’s publisher, Casa Ricordi. It restores all of the opera’s original text, which had been heavily censored, and accurately reflects Verdi’s colorful and elaborate musical setting. Does anyone know why Verdi never attempted to have the libretto of Giovanna d’Arco fixed? The music is wonderful and deserves to be heard but it hasn’t been which I would attribute to the libretto which is an incoherent mess. Odyssey’s production was terrific, as usual. I loved everything about it from the staging to the performances. However the libretto is just bizarre, the battles are never shown, they are just mentioned in passing, at the end they announce that by the way we won but Joan is dead, they bring her body back and then she is mysteriously resurrected as a zombie (I’m not making this up). The historical Joan of Arc was burned at the stake, a pretty effective way to prevent zombieism. Did Verdi not know how poor the libretto was?, did he know and not care? did he know and not have the time to have someone fix it? or did he think it was beyond repair?